You don't even have to boil the pasta or pre-cook the chicken! 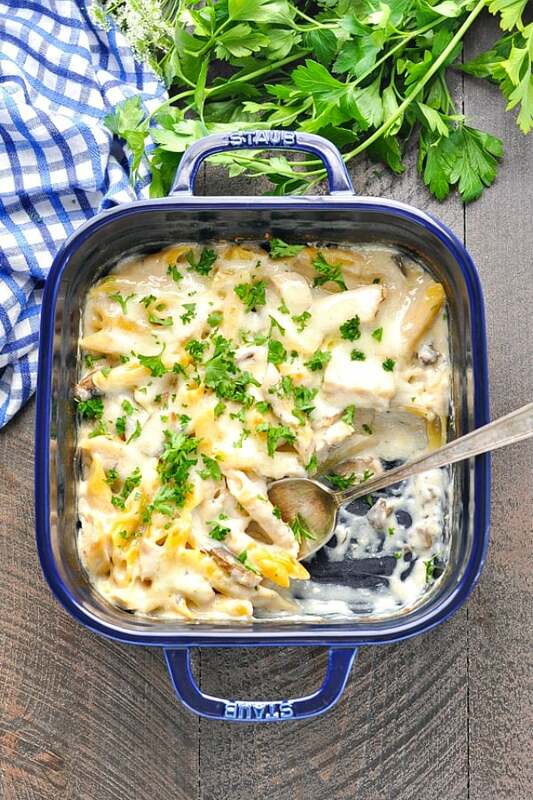 For a quick and easy dinner recipe with just 5 minutes of prep, you can't beat a Dump-and-Bake Chicken and Mushroom Casserole! You don’t even have to boil the pasta or pre-cook the chicken! 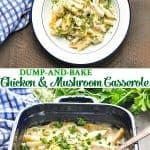 For a healthy and easy dinner recipe with just 5 minutes of prep, you can’t beat a Dump-and-Bake Chicken and Mushroom Casserole! This one dish meal pleases even the pickiest palates! Don’t think that your kids like mushrooms? Well, think again! 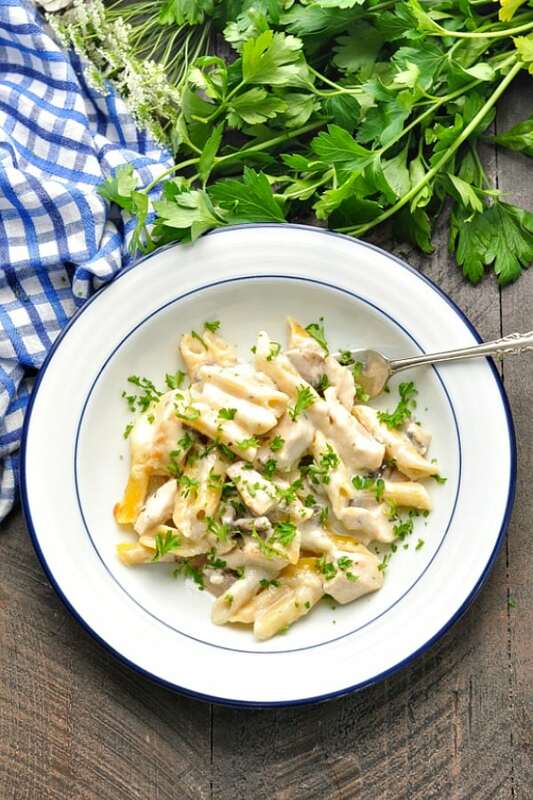 Your little ones will adore the mild, creamy taste of this sauce, which coats the tender chicken, mushrooms, and pasta in this easy weeknight dinner! With only a few basic pantry staples and about 5 minutes of prep, you can serve your family a wholesome and creamy pasta bake. It makes mealtime simple, so that you can focus on other more important things. Homework? Laundry? Baths? The list goes on, but at least you don’t have to worry about what’s for dinner! 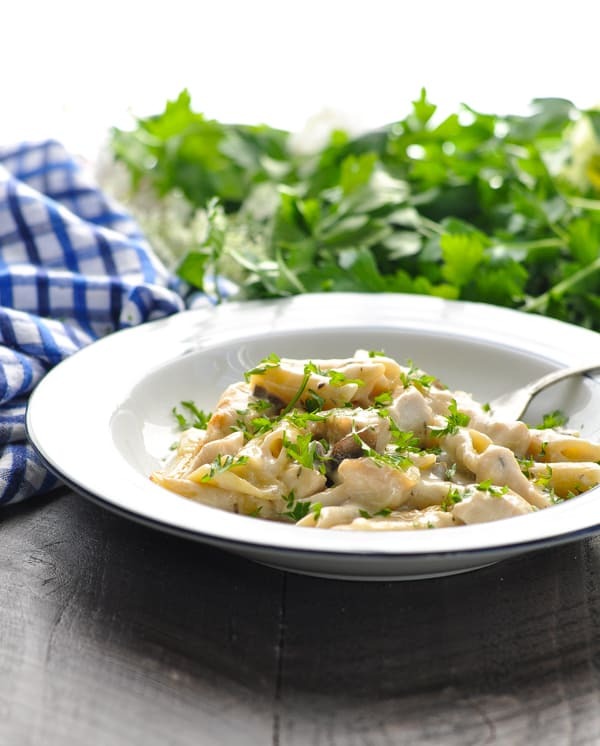 First, let’s start with the creamy sauce for your chicken and mushroom pasta bake. You’ll need chicken broth, a can of condensed cream of mushroom soup, milk, thyme and salt. 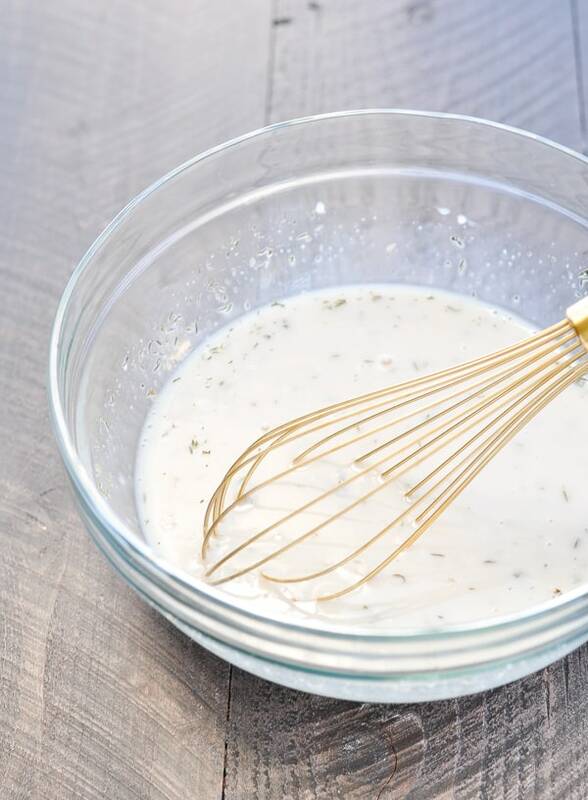 Whisk together the sauce in a large bowl. Add uncooked penne pasta, uncooked chicken, and sliced mushrooms. It looks like a lot of liquid, but the pasta will absorb most of it while the casserole bakes. Transfer the mixture to a baking dish and cover tightly with foil. and sprinkle grated mozzarella cheese over top. Return the dish to the oven (uncovered) for about 5 more minutes, or until the pasta is tender, the chicken is cooked through, and the cheese is melted. It’s like a dump-and-bake miracle! 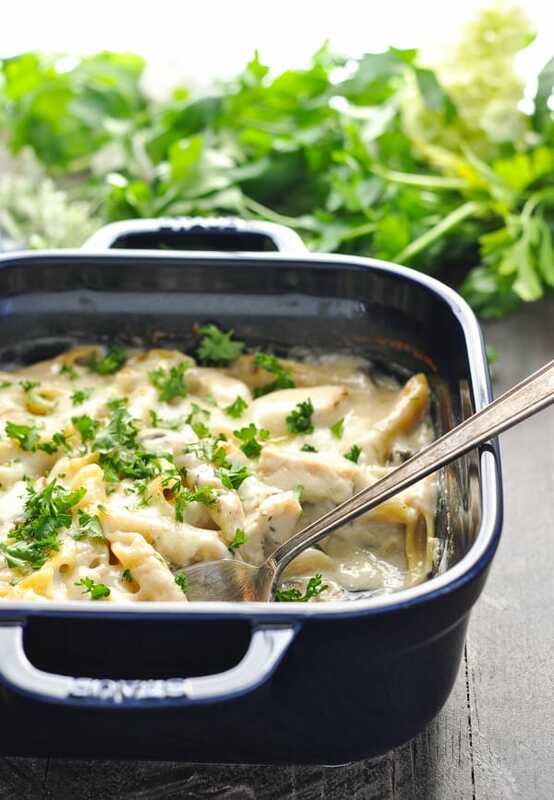 Can you freeze Chicken and Mushroom Casserole? Yes! 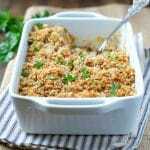 You can assemble the casserole in advance, cover tightly, and freeze before baking. Thaw in the refrigerator overnight before proceeding with baking instructions. Have leftover cooked chicken on hand? You can use the cooked chicken in lieu of the raw chicken, if you prefer. 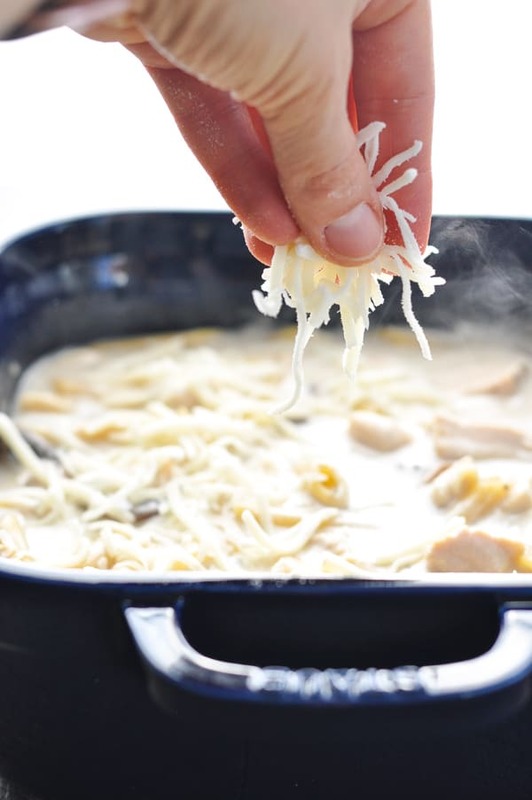 Stir the cooked chicken into the casserole at the same time as the sour cream towards the end of the cooking time. I use Campbell’s Healthy Request Cream of Mushroom Soup, but you can substitute with an organic condensed soup or with another flavor of condensed soup (such as Cream of Celery soup). Love mushrooms?! Feel free to stir in even more mushrooms than called for! Garnish the finished dish with grated Parmesan cheese and fresh herbs for an added layer of flavor. 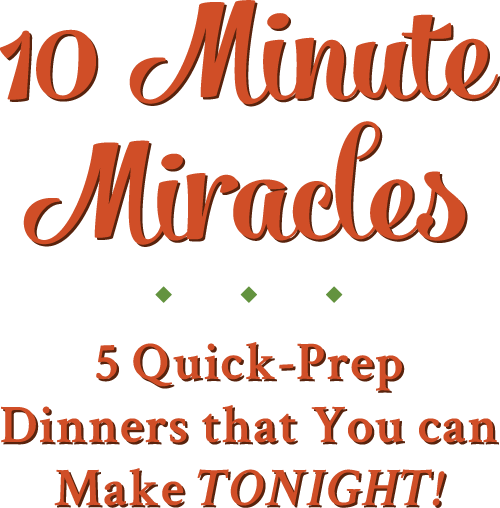 Again, the goal is EASY weeknight dinners, and this is a winner that you’ll want to hold onto! Preheat oven to 425 degrees F. Spray an 8-inch square baking dish with cooking spray and set aside. In a large bowl, whisk together condensed soup, milk, chicken broth, thyme, salt, garlic powder and pepper. Stir in mushrooms, raw chicken, and uncooked pasta. Transfer mixture to prepared baking dish. Cover tightly with foil and bake for 35-40 minutes (until pasta is almost tender). Remove foil and give everything a stir in the dish. 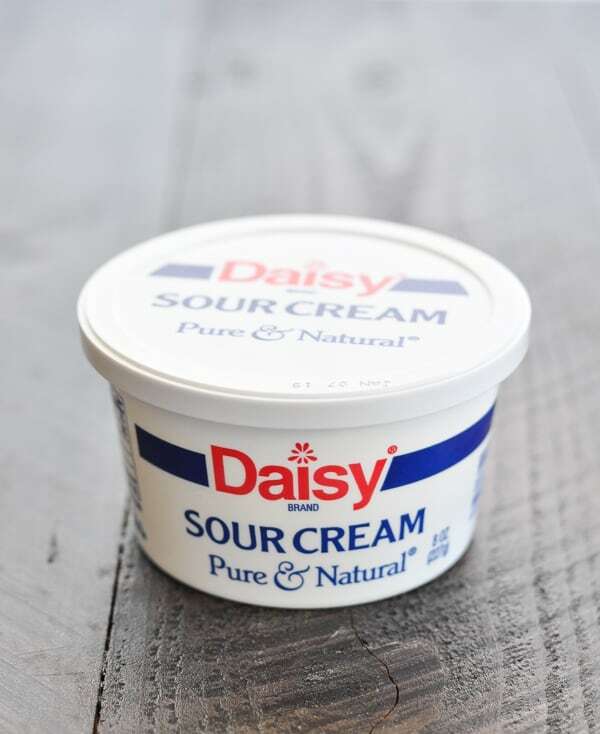 Stir in sour cream, and sprinkle mozzarella cheese over top. Return to the oven and bake, uncovered, for 5 more minutes, or until pasta is tender, chicken is cooked through, and cheese is melted. Let the dish stand for about 5 minutes before serving. 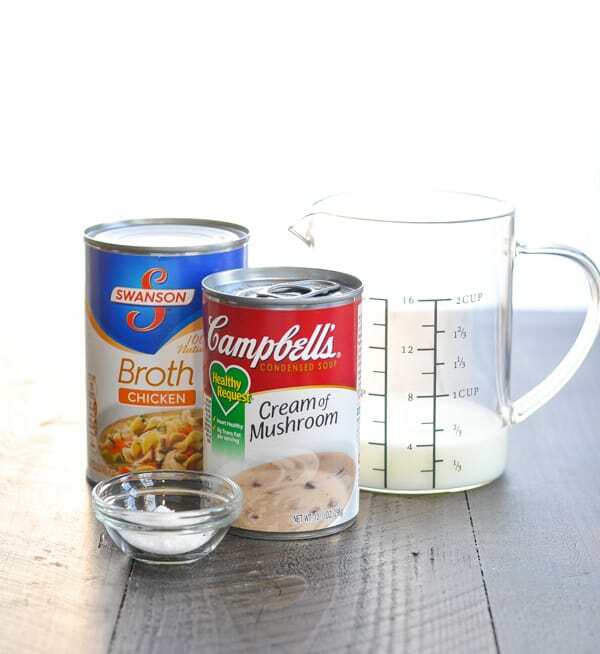 I use Campbell's Healthy Request Cream of Mushroom Soup, but you can substitute with an organic condensed soup or with another flavor of condensed soup (such as Cream of Celery soup). This post was originally published in January, 2016. It was updated in January, 2019. I absolutely LOVE mushrooms, so I feel like this dish was meant for me! My husband doesn’t really like them, which is fine because then I get to eat them ALL! 🙂 This casserole looks fantastic, Blair! I love how easy it is to make, too. Sounds like the perfect winter meal! I have to admit, I’m not too fond of mushrooms. But the hubster loves them, so I try to cook with them as often as I can tolerate. 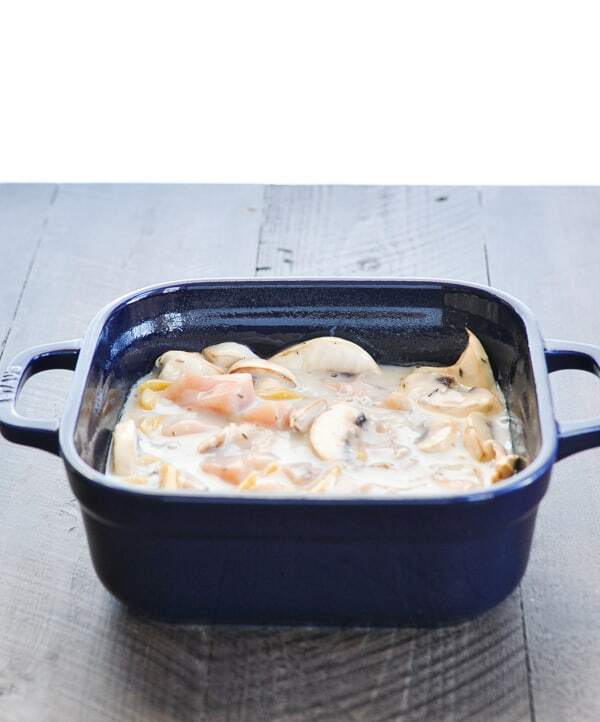 I love the simplicity of this casserole. 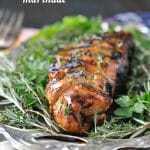 It would be great for a weeknight meal, when I don’t feel like slaving for dinner! Exactly, Lisa! It’s actually very light…but you’d never know it from the taste or texture! Thanks so much for stopping by! 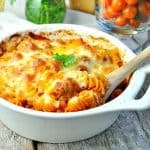 Would it work to put this casserole together the night before and refrigerate it overnight to bake the next morning? Hi, Rhonda! Yes! I think that should work really well! Mom, my brother, and I loved this! I used less thyme than called for, otherwise followed recipe. Next time I will add some freshky ground peppee and a bit of paprika. Would you adjust the cook time if you’re using precooked chicken? Hi, Maureen! No, you don’t want to adjust the total cooking time because the pasta needs that long to bake. 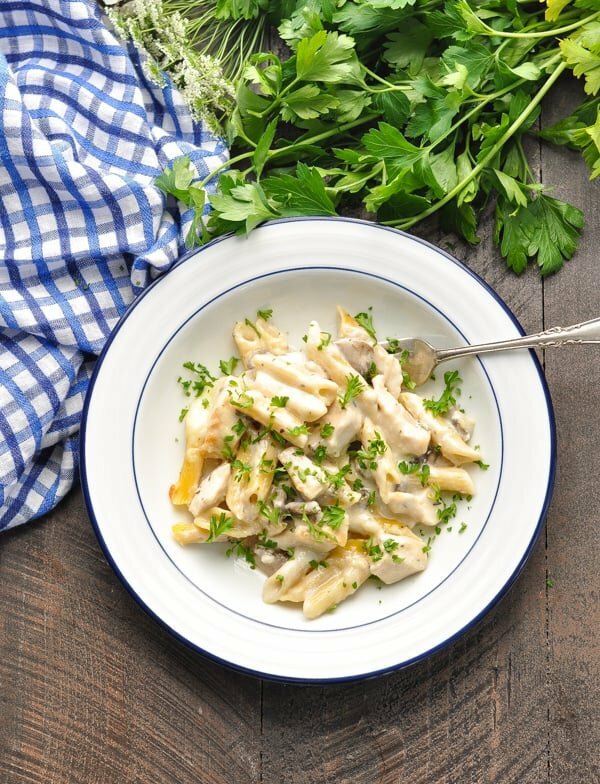 I would stir the cooked chicken into the dish at the end (when you add the sour cream) so that it has time to warm up in the oven, but it doesn’t get overdone during the full cooking time. Enjoy! Blair, could I substitute egg noodles for the pasta? Hi, Marge! 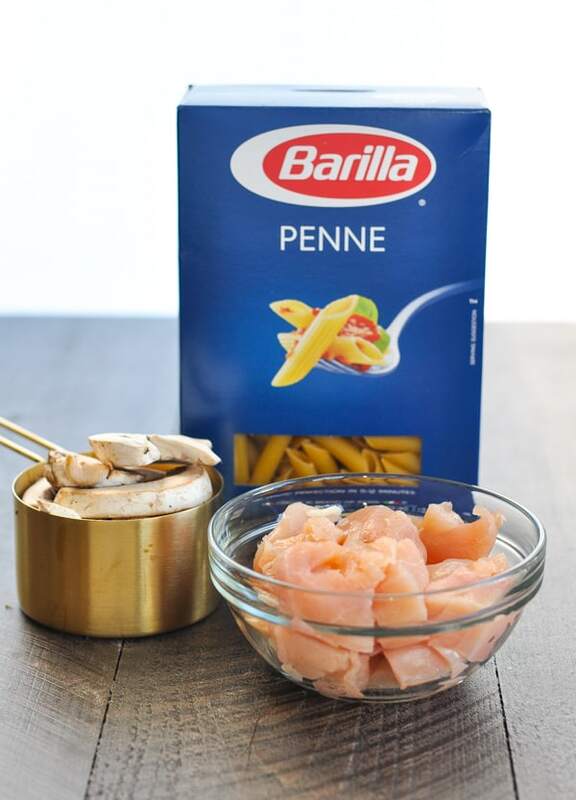 The penne that I used has a suggested cooking time on the box of 11-12 minutes. If you can find egg noodles that have a similar suggested cooking time, they should work perfectly. If your egg noodles have a recommended time that’s less than 11 minutes, you may need to decrease the total time in the oven by about 5 minutes (or increase the baking time for a noodle that requires longer). Hope that makes sense! This looks like a new recipe. Do you still have the previous one before it was updated? I really preferred the older one, that wasn’t a dump and bake. I should have printed it off! Cook pasta until just al dente, according to package instructions. Meanwhile, preheat oven to 350 degrees F. Spray a 9- x 13-inch baking dish with cooking spray and set aside. Melt 1 tablespoon butter in a large skillet over medium-high heat. Add mushrooms and cook until tender, approximately 7-8 minutes. Remove mushrooms from skillet and set aside. Melt remaining 1 tablespoon butter in same skillet. Add flour and stir to cook for about 1 minute. Whisk in broth, milk, salt and thyme and bring to a simmer, stirring constantly. Allow sauce to cook until it thickens, whisking regularly so that the sauce is smooth (about 10 minutes). 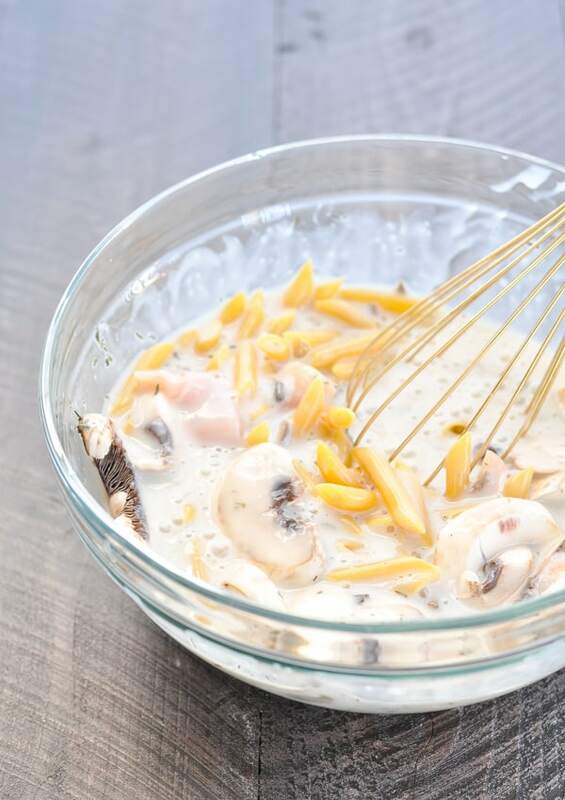 Remove from heat, stir in cooked pasta, mushrooms, and chicken. Transfer chicken mixture to prepared dish. Top with mozzarella and sprinkle with Parmesan. Cover and bake for about 15 minutes. Remove cover and cook for an additional 5-10 minutes, or until bubbly and heated through. Could sun-dried tomatoes be substituted for the mushrooms? Neither my daughter nor I are fans of mushrooms, but we both love sun-dried tomatoes. Absolutely! That sounds like a delicious substitute! Hey Blair, I have told you before how much I enjoy your simple recipes. 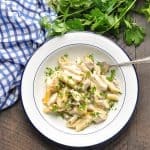 I have a question about this recipe. I have a package of chicken I need to use and everything I need to make this recipe. I also have a refrigerator package of chopped onion,celery carrot mix ( meripox) that needs to be used. 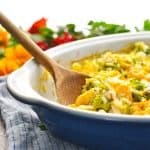 Do you think if I saute’d the mix in a little olive oil it could be added to this casserole, or would the flavors not work well in this particular dish? Thanks again for your recipes and the really good stories / pictures of Madison County. 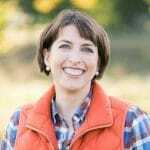 Love hearing about Culpeper, Charlottesville & Orange County and Madison. So easy that I wouldn’t have believed how tasty it was! I added some sherry (maybe 1/4 cup) andnit was divine. I’m sure Marsala would be great, too. Very easy and quick to put together while you go do something else. I think a can of Rotel would add a little kick and be super easy too. Was looking for a quick after work recipe and this fit the bill, a repeater. I loved it, I doubled the recipe using chicken thighs, macaroni and cheddar cheese (because that’s what I had available. Definitely a keeper!